The Swordfish 1600XCD Cross-Cut Shredder is ideally suited for use in the office. Shredding up to 16 sheets of 80gsm paper at a time, this shredder will shred your highly sensitive and confidential documents into cross-cut pieces measuring 4 x 39mm. Each sheet of A4 paper is therefore shredded into approximately 400 pieces and this gives the shredder a P-4 DIN security rating (for highly confidential shredding). With a long continuous run time of 60 minutes the 1600XCD will shred approximately 2600 sheets per hour, great for a busy office environment! 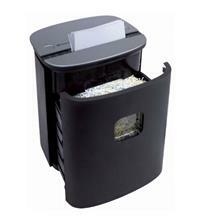 In addition to paper, the shredder also shreds a variety of materials including credit cards and CDs. There is also no need to remove small staples and paperclips, as the machine will handle these too. The slide-out waste bin is easy to empty and the bin capacity on this machine is a good sized 29 litres - that means it can take around 410 shredded sheets before you need to empty it! Other features include: castors so the shredder can be easily moved around the office; feed entry width of 222mm (for A4 paper shredding); a reverse function; a bin viewing window so you can see when the shredder is getting full; a long run time of 60 minutes (after which the shredder will need a 40 minute cool down period); and a bin full indicator. Warranty on the Swordfish 1600XCD Cross-Cut Shredder is 2 years for the machine and 2 years for the cutters.